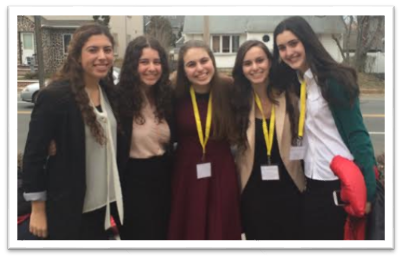 Congratulations to the entire Yeshivah of Flatbush High School Model Congress team for their performance at the annual Yeshiva League Model Congress, organized and hosted by HAFTR High School, on Wednesday, March 25. Over 200 student “delegates” from various yeshivah high schools took part in the event, breaking into different committees to present original bills, debate, amend and vote on other bill proposals and learn firsthand how the legislative process works. Kimberly Alweiss, Daniella Babaee, Joseph BenHaim, Raquel Cohen, Sarah Coopersmith, Max Edeson, David Idy, Gabe Vizgan, Ben Wade and Miri Zenilman all participated at a very high level, while Shlomo Husni was awarded a certificate for outstanding performance within his committee. The event was an educational and enjoyable experience for all concerned. We look forward to future success in this program with next year’s sophomore, junior and senior members!